The Kristin Michelle Mason Art Gallery at Beacon College was formally opened and dedicated in February of 2014. 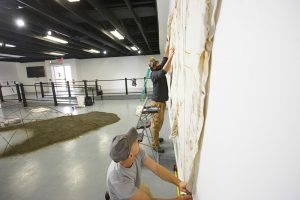 It is located inside the Mason Art Center located at 103 East Main Street. Exhibitions have included student shows, faculty shows, senior portfolio shows, in addition to exhibitions from professional artists. The public is always welcome to view the current exhibition in the gallery, and events are free. Artistic mediums displayed in the gallery have ranged from traditional paintings to installation art to performance pieces. Experimental art forms are appreciated. Artists interested in being featured in an exhibition should contact Gallery Director Dustin Boise at dboise@beaconcollege.edu or 352-638-9726. The gallery is open Monday-Friday from 9:00am-5:00pm. For special events, additional hours may be offered, including weekend hours. Opening exhibition receptions are generally held from 4-6pm. The Mason Art Gallery hosts rotating art exhibitions featuring the work of Beacon students and alumni as well as art work from local high school students. 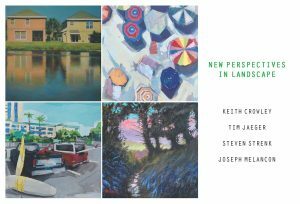 New Perspectives in Landscape is a group exhibition of four painters based in Sarasota, FL, Keith Crowley, Tim Jaeger, Joseph Melancon, and Steven Strenk. Capturing landscapes and the natural world has a long tradition of inspiring artists throughout art history and the four artists in this exhibition continue to be drawn to this subject and provide us with a fresh approach about the places we inhabit in Florida. This years show is juried by artist Scott Conard and features the work of Beacon students. Scott was featured in a solo exhibition entitled “Lost” in spring 2017 (see below). 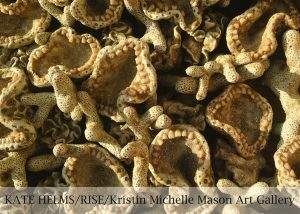 Rise centers around fantasies of a luxuriously ornate homes being dismantled by the climatic effects of sea level rise and tossed into the ocean, where it becomes an artificial reef for a variety of barnacle, coral, and sponge-like encrustations. In contrast to widespread coral bleaching, which is causing vast swaths of coral reefs to rapidly perish into milky oblivion, these new species spontaneously evolve to thrive in the changing environment. Incorporating Victorian furniture, the show references the beginnings of the industrial era, in which humans began to substantially contribute to climate change by adding heat-trapping gases such as carbon dioxide to the atmosphere. Kate Helms, a fifth generation Floridian artist and scientist, is currently the Stormwater Program Administrator for the City of Largo Florida, where she oversees stormwater pollution prevention efforts. She has previously worked on projects dealing with Everglades restoration, the BP Deepwater Horizon oil spill, oyster restoration, wetlands mitigation, and compliance and enforcement with environmental regulations as a member of the Florida Department of Environmental Protection. She possesses a Bachelor of Science in Environmental Science, a Bachelor of Arts in Art, and Master of Fine Arts in Sculpture from the University of Florida. Helms’ artistic practice is deeply rooted in her experience with often-bizarre aspects of Florida history, culture, and ecology, as well as her concurrent – and often illuminating – career in the environmental sciences. 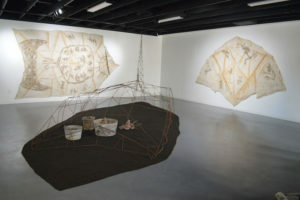 She has exhibited at the Appleton, Boca Raton, and Alexandria Museums of Art, as well as at galleries both domestic and abroad. 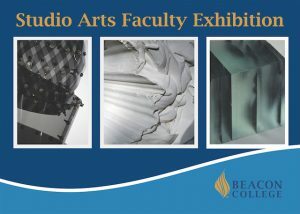 The Faculty Exhibition showcases work from Beacon College’s Studio Arts faculty members Kim Watters, Russ Bellamy and Dustin Boise. Through their use of various materials, methods, and research the works displayed represent the possibilities of art. Works range from painting, assemblage, glass, installation and sculpture. 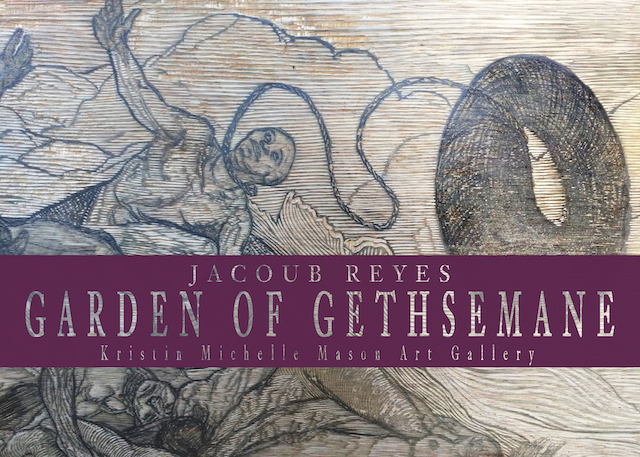 The Garden of Gethsemane is a solo exhibition by Jacoub Reyes that explores the relationships between religion, mortality and the human condition through a series of woodcuts and prints. Reyes embodies the plight and influence of colonialism on native groups with images saturated in symbolism and religious mysticism. Using well-known archetypes and philosophical theories, he analyzes the relationship between ideologies that influence cultures and their similarities. Jacoub Reyes is a multi-disciplinary artist living and working in Orlando, Florida. He has been featured in several publications such as The American Institute of Graphic Arts, Centric, and Artborne Magazine. A recipient of the Southern Graphics International grant award, J.R. Hopes scholarship, Master Scrounge Printer award by Ke Francis and other accolades. Jacoub prides himself on creating materials and using found objects to create surfaces for his prints. 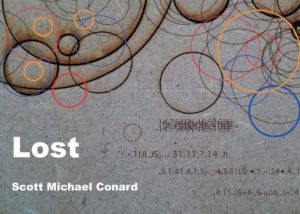 Lost by Scott Michael Conard is a solo art exhibition that discusses Scott’s past four and half years of living abroad. The exhibition contains prints, found objects, wall pieces and interactive installation. Much of the works are personal reflections of topics that Scott has dealt with while living and working in a foreign country. Lost, explores emotions that range from loneliness, sadness, to the effects of ill health. The exhibition also explores ideas of cross-culturalism and the feeling of being confused living in a foreign country. It is also an exhibition that continues Scott work into creating engaging interactive installations as well as new explorations into illustration and experimental typography all through the use of common computer graphic software. Scott Michael Conard, born in Livingston, Montana, but spent most of his formative years in Cleveland Hts., OH and calls it home. Scott completed his Master of Fine Arts degree at the University of Cincinnati 2005 specializing in Electronic Arts. He was Workshop Chair for the International Symposium on Electronic Art 2014 in Dubai, UAE and is the Co-Chair of the New Media Caucus Showcase event at the College Art Association’s Annual Conference in New York City 2017.  Scott has been in screenings and art shows both nationally and internationally, including Lafeyette, LA, Cleveland, OH Los Angeles, CA, Kerrville, TX, and Dubai, UAE. Chris Padilla describes his art work: “My journey begins when I dream or am in deep thought—my imagination is fed by my recurring dreams. It is here that I then turn these dreams and deep thoughts into reality. I work hard to create pieces that speak to viewers about the choices we make. If we continue to repeat our mistakes, what will the future of humanity hold for us? Through my pieces I want people to come together and become good; not bad-to live in peace and realize that you are living in the real world; to stop destroying nature. Accepting love and friendship; losing one that matters the most. Allowing the viewers to feel. When we see things that are not right, we need to fix it through exploration and change the ways we see things into nature and beauty. Every single piece is a shattered memory; filled with despair and misery but also beauty and grace. Some may find it dark; some may find something that brings a smile upon your face. This exhibition is an exploration of the imagination–filled with nightmares and a spiritual connection to the real world. Artist Lee Clarke long has been drawn to the intriguing correlation between masks used for different purposes and that confluence of truths. 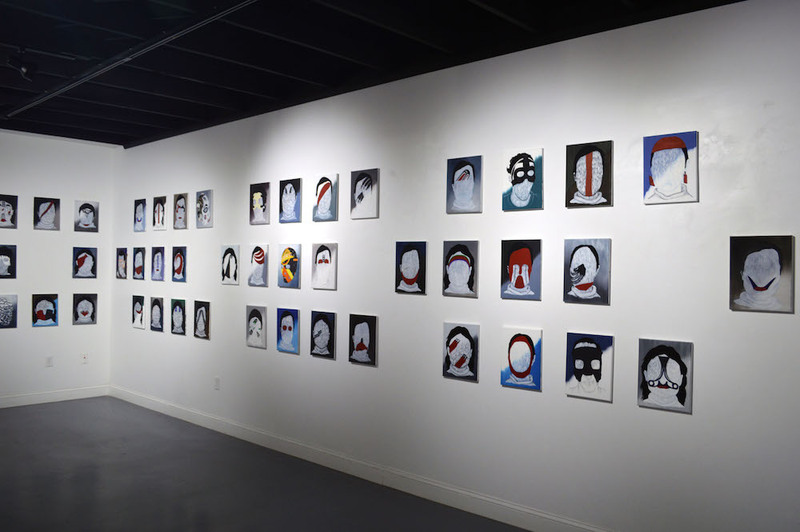 Clarke explores that interplay in his series, “The Masked Project,” now on display through November 10 at the Kristin Michelle Mason Gallery. “Ceremony, theatre, stage and the spectacle of sport and warrior culture have a curious connection,” he says. “The power of the mask, the way it conceals and emboldens the wearer at the same time are something I find very intriguing.” The Canadian artist now lives in Winter Park, Fla. and teaches art for the online departments of the Los Angeles Film School and Full Sail. See The Masked Project at the Mason Art Gallery through November 10.